You can get it to do just about anything you can imagine for a fraction of the price of other systems. I have to call MightyCall to have them help me configure it, which they always do promptly and patiently, but sometimes I try to do it myself and it never works as well as if I just call them and have them help me configure it. I don’t like that I get notified that I had “recent activity” I don’t know if that is a dropped call or an important text message. I wish it distinguished between text messages, voicemails and dropped calls By having people press “1” to speak to me or leave a message, I have almost completely eliminated robo-calls. Most robots don’t follow voice commands. I have to call MightyCall to have them help me configure it, which they always do promptly and patiently, but sometimes I try to do it myself and it never works as well as if I just call them and have them help me configure it. I don’t like that I get notified that I had “recent activity” I don’t know if that is a dropped call or an important text message. By having people press “1” to speak to me or leave a message, I have almost completely eliminated robo-calls. Most robots don’t follow voice commands. 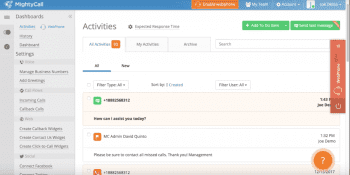 Easy to manage portal; easy to see all activity at a glance. Most importantly it really helps us as a service company to manage any missed calls or customer that may have hung up before reaching a company representative. Wish they had a global blacklist feature and/or an easier way to add calls to a blacklist. We get tons of spam / bot calls everyday and need to be able to block them quickly. Easy to manage portal; easy to see all activity at a glance. Most importantly it really helps us as a service company to manage any missed calls or customer that may have hung up before reaching a company representative. Wish they had a global blacklist feature and/or an easier way to add calls to a blacklist. We get tons of spam / bot calls everyday and need to be able to block them quickly. Seamless. Messages easy to retrieve …. Seamless. Messages easy to retrieve . The price is right as well. I can retrieve messages on any device. Seamless. Messages easy to retrieve . The price is right as well. I can retrieve messages on any device. It is very easy to use and at an affordable price. 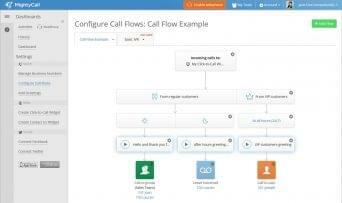 The IVR feature as well as the call flow feature are top notch. Have received a couple of calls that never got forwarded through to my cell phone, but besides that there is no problem. It is very easy to use and at an affordable price. The IVR feature as well as the call flow feature are top notch. Have received a couple of calls that never got forwarded through to my cell phone, but besides that there is no problem. Lots of different features for allowing IVR, hold music, queues, round robin, etc. Can use webphone or cell phones, so it makes it flexible for the staff to answer calls. Great customer service, always available to help. 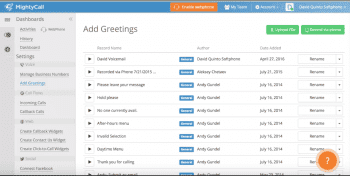 Not great for organizing calls if you have employees that work in different departments. Would love to be able to add contacts to mightycall so we know the client calling. A veteran to business VoIP, MightyCall has been delivering cloud communications solutions to small businesses and entrepreneurs since 1999. With headquarters in Seattle, WA, MightyCall offers their services all across the United States, empowering the smallest businesses with the biggest and best features previously restricted to expensive enterprise solutions. With a low entry price, MightyCall’s mission is to combine the power of mobile apps along with the Cloud to enable even the smallest teams to gain a professional advantage over their competition. By combining social media, phone and email into one integrated platform, your business can stay on top of their communications while providing that professional image customers have come to expect. MightyCall’s affordable pricing structure and feature packed service enables even the one-man band Entrepreneur to gain access to the tools they need to revolutionize their business. Today, MightyCall services over 50,000 customers, powering 5 million minutes of phone conversations each month. Leveraging a Business VoIP solution is one of the easiest ways for any business to not only cut costs, but also gain access to a feature packed communications platform unrivaled by traditional services. 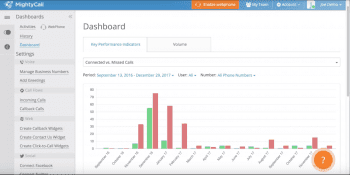 MightyCall is no different, offering one of the most compelling packages we have seen for SMBs and Entrepreneurs that are in the market for an affordable yet featured packed hosted VoIP solution. With almost 20 years of experience in combining Cloud and Mobile apps, MightyCall delivers a complete solution without breaking the bank. Pricing starts at an incredibly easy to swallow $19.99 per month, and does not limit the number of users or extensions your business gains. In fact, on all of their pricing plans, MightyCall offers unlimited extensions. This is actually a bit unique of MightyCall’s pricing structure, with limitations placed on minutes and available phone numbers, as opposed to directly limiting users and business size. The benefit is that even a larger team without the need for extra minutes can cut costs by subscribing to MightyCall’s Basic plan, as opposed to being forced into a more expensive plan simply because of the size of their team. This positions MightyCall as a solid choice for small to midsize businesses searching for a new communications platform. MightyCall’s solution is also a bit unique in the way it handles different methods and channels of communication. While their main service is providing your business with a complete VoIP solution, MightyCall also offers integrations with popular social media platforms like Facebook and Twitter, as well as direct email integration. This enables your business to handle not only incoming phone calls, but emails and social media mentions as well, all combined in to one single, seamless user interface and call queue, providing your business with an easy way to stay on top of every communication channel. Overall, we feel that MightyCall stands as one of the strongest options for SMBs looking to leverage Cloud communications within their business. Whether your team simply needs a single phone number for local customers, or requires a complete platform to track multiple communication channels, Mightycall provides the features necessary to establish that professional image, and gain a handle on your business’ communications. What Do You Think of MightyCall?